With more Emmys and Grammys than any other children’s television show and as the world’s first nonprofit to reach one billion YouTube views, Sesame Workshop is also the most qualified to undertake such a necessary initiative. It is not surprising the exemplary IRC is their partner. Sesame Workshop recently created the muppet Zari, whose name means “shimmering,” a six-year-old with multicolored hair wearing a head scarf with her school uniform, to appear in the Afghan version of the show, called Baghch-e-Simsim, which translates to “Sesame Garden.” Zari is meant to encourage girls’ empowerment, health, and emotional wellbeing. 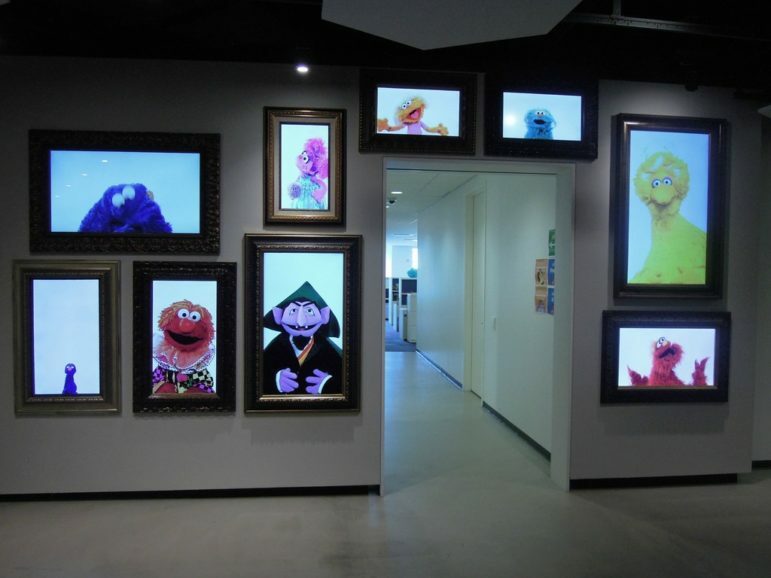 Sesame Workshop’s other international characters include Muppets in Bangladesh, Egypt, Germany, Mexico, and many other countries. Sesame Workshop characters model as well as teach. The characters are meant to entertain the adults as much as the children. The project will likely begin with a pilot near Syria and possibly in East Africa. Depending on the location, the type of content will vary. Syrian refugees often have access to smartphones, and sometimes TV. In other places, Sesame Workshop might develop printed stories or radio. The IRC, which has started preschools in a few areas, will help guide the content. In March, Sesame Workshop spent a day in the Zaatari refugee camp in Jordan, and has run other pilots. But the partnership with IRC will be the first time it has run an ongoing program with refugees. With the number of refugees and internally displaced people reaching its highest point since World War II, the hope is for this project to expand for others to help to address the needs of children, especially in light of this new report produced by Amnesty International: “My Children Will Die This Winter”: Afghanistan’s Broken Promise to the Displaced. The number of Afghans internally displaced by conflict has “dramatically” doubled to 1.2 million in just three years, Amnesty International said on Tuesday, warning that a lack of basic services was putting people on the brink of survival. The rights group said that situation of people uprooted from their homes in Afghanistan has deteriorated in recent years, as global attention and aid money have been diverted to other crises. “While the world’s attention seems to have moved on from Afghanistan, we risk forgetting the plight of those left behind by the conflict,” said Champa Patel, South Asia director at Amnesty International. “Even after fleeing their homes to seek safety, increasing numbers of Afghans are languishing in appalling conditions in their own country, and fighting for their survival with no end in sight,” she said in a statement. We wonder what impact Zari’s character could have on children around the world, including America, where children are increasingly exposed to Islamophobia, either in schools or in public. One only need read the conservative reactions to Zari, who is after all on a U.S. government-funded TV show, to realize Islamophobia has an uphill battle in America. While Sesame Street already boasts an increasingly diverse cast of Muppets, incorporating characters from any of the 34 international productions into each other’s shows would only further the show’s mission of educating children. Although the international versions are carefully tailored to the individual areas where the programs are aired, couldn’t the characters make occasional appearances in another version? Sesame Workshop and IRC need financial support and encouragement to both reach as many refugees and displaced children as they possibly can and at the same time to help the world to not forget they are there. What better ambassadors for such a message could there be than characters like Elmo, Big Bird, and now Zari?